The release from Cannonsville has been bumped up slightly to 381 cfs this morning. 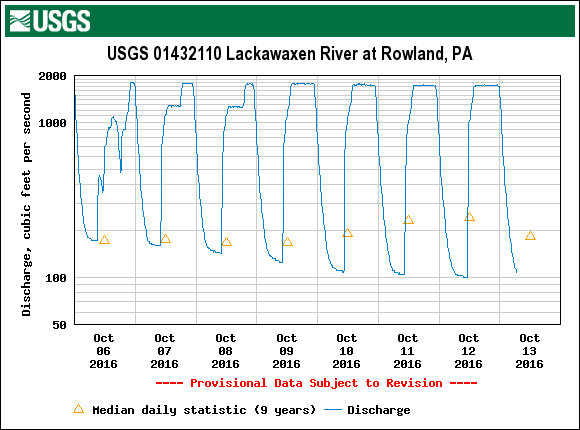 Hopefully Lake Wallenpaupack is getting low enough they will cut the discharge to the Lackawaxen river and use a combination of Pepacton and Cannonsville to meet the downstream flow targets. We still have a decent chance to for some showers today but the amount of precipitation looks lower than originally predicted. Weatherunderground is now calling for .04″ rather than 1/4″. Some of the rain may be in isolated cells so hopefully one sits on us for a while. Winds will be around 10 mph today with cloud cover. We are still seeing most of the fish eating under the surface but some river sections had decent heptagenia hatches yesterday mixed with the olives.